Metal Detector is in the 3rd set of the Smart Tools collection (EMF detector, ghost detector). 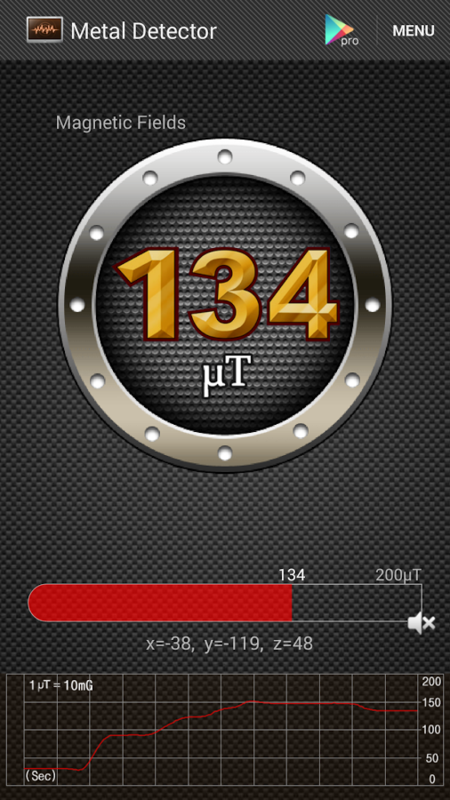 This app measures magnetic field value using the built-in magnetic sensor that is built into your device. The magnetic field level(EMF) in nature is about 49μT(micro tesla) or 490mG(milli gauss); 1μT = 10mG. If there is any metal in the area, the strength of the magnetic field should increase. Sometimes, this app used to find electrical wires in walls (like a stud finder) and iron pipes in the ground. Usage is simple: Open this app on your device, and move it around. The magnetic field level will constantly fluctuate. That’s it! If this app does not work properly, it may mean that your phone’s sensors are damaged, broken or non-existent. To initialize the sensors, point your phone up towards the sky and move it in a figure 8 pattern. Especially, a view cover with a magnet or a leather case with a magnetic snap can cause unwanted results. Get [Smart Compass Pro] and [Smart Tools] package.